I’ll have to say that you I alway have a slight bit of caution approaching traditional British pub fare like Fish and Chips or a Sunday Roast. While there are a lot of places doing some serious justice to the concepts, both of items are also easily screwed up. To do fish and chips right requires enough mastery of what us Yanks call the “Frialator Arts” (side trivia question: do UK folks recognize the “Frialator” name? ), since doing fish correctly requires one oil temperature, and doing chips right requires [i]two[/i] different temperatures, and as a result most places end up either over- or under-cooking half of the dish. 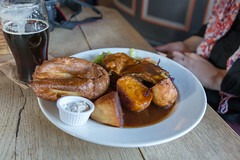 Doing a Sunday Roast requires decent mastery of both meat roasting and vegetable roasting as well, and as a result, London (and the UK) have more than a few pubs, chippies, and carveries that seem to aim at satisfying tourists and cheapskates with low-grade versions of the dish. 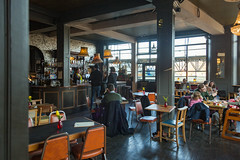 Westow House, however, is a great example of a classic British pub that’s still got the overall basics nailed down. The pub itself is housed in a great Victorian house that, while the outside was enrobed in scaffolding due to repairs during our visit, the inside is a pleasant, spacious Victorian-style pub with lots of both tables and couches for seating (and, pleasantly for myself, they aren’t stodgy about the occasional canine visitor, also adding some nice ambiance that way). The beer list is a nice combination of both traditional English-style lagers and ales as well as several taps dedicated to new-style IPAs and the like from up and coming breweries. For this trip, I had been in the UK almost a week and a half and had yet to indulge in some fish and chips, and after seeing an order emerge from the kitchen for another table, I decided to take the plunge here. 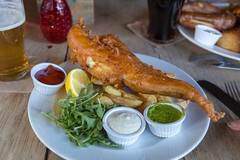 As a good start, I like that instead of the fairly common cod, Westow House uses haddock for their fish and chips, with a modestly beer-laden batter. They’ve got the cooking down pat: the fish itself was perfectly cooked to a flaky and moist tenderness, the breading adhering well to the fish. The breading was a little thicker than I like, but well crisped, not overly oily, and having just enough of a beer taste to add some more taste to it. The net combination of these was a breaded filet that was flavorful without being heavy, exactly what I want in a good fried fish. Add in some competent chips and mushy peas, and I was quite satisfied. Carol, however, opted for the Sunday Roast, and I think she chose wisely as well. Starting with the beef, this roast was a nice Welsh black beef rump, cooked up to a nice medium, with both fair amount of flavor and still being tender. The beef itself was also nicely elevated by a tangy house-made horseradish cream sauce, a light gravy, and a Yorkshire pudding to sop up the drippings. A lot of times the vegetables take a back seat with a roast, but here the rest of the plate was also quite nicely done, with some rosemary-garlic roast potatoes, some braised cabbage, and a medley of roasted vegetables. 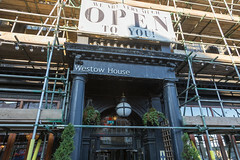 Overall, we really enjoyed Westow House. Scaffolding aside (a temporary issue), they’ve got both the ambiance and the menu for a traditional pub down pat, and provide a pleasant environment to relax after a morning exploring. I’d not hesitate to come back.